So many of the smiles I showcase are surgically involved, or contain multiple anterior porcelain veneers and/or crowns. While this particular case wasn’t packed with anterior porcelain, the outcome is no less dramatic than those that are. I specifically selected this patient to show that a big transformation sometimes only requires a little dentistry. This case began in summer 2011. The patient's chief complaint was the severe crowding of his lower teeth, a sizable chip on one of his lower front teeth and restoration of his posterior teeth (molars), which had visible decay. We presented him with a three phase treatment plan that included restoring his posterior teeth with porcelain onlays and crowns, correcting his crowding and bite issues with Invisalign, and finally addressing the sizable chip on his lower front tooth with a porcelain veneer. We also referred him to an oral surgeon to have his wisdom teeth extracted before Invisalign treatment commenced. Phase I involved removing existing amalgam (silver) fillings and decay, and replacing them with porcelain crowns and onlays. Porcelain was the best option, because too much tooth structure was compromised to sufficiently restore with resin based composite (tooth colored filling material). We were able to prep and deliver his restorations the same day with use of CAD/CAM technology, eliminating the need for temporary restorations during lab fabrication time, and subsequently a second appointment to deliver the restorations. Additional decay was removed from several front teeth and restored with composite bonding. We next referred him to an oral surgeon for extraction of his wisdom teeth prior to beginning Invisalign treatment. Once the extraction sites healed, we took upper and lower impressions and a series of photos for the Invisalign prescription. Roughly 4-6 weeks later we received the digital case design and series of aligners from Invisalign. Each aligner is worn for two weeks before proceeding to the next. Aligners are delivered 3 at a time and patients are seen by Dr. Emery every six weeks to monitor progress. 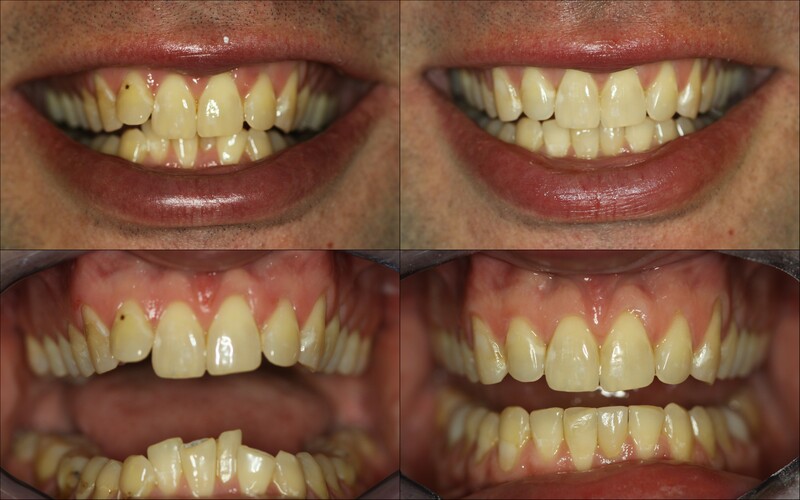 This case was more involved and took about 18months to complete, however the patient wasn't bothered by the duration, because the aligners are invisible and generally go unnoticed. The end result was spot on. Our patient's smile and bite were beautifully aligned! Addressing a sizable chip on one of the lower anterior teeth was the final phase. Thanks to Invisalign his teeth were perfectly straight, allowing us to conservatively prepare the tooth and take an impression for the lab to fabricate a porcelain veneer. A temporary was placed during lab fabrication time and the final restoration was delivered about two weeks later. Because this was a single unit restoration, we utilized on-site custom shading to ensure the veneer would be an exact match to its neighboring teeth. We now see this patient every six months for preventive care and he's wearing a retainer at night to maintain the Invisalign results. The finale was a long time coming, but the end product was well worth the wait. Contact us today to start your own smile makeover story.